On April 24, a crew of volunteers from Oak Ridge High School Interact Club, Oak Ridge staff, El Dorado Hills Rotary and other individuals and organizations spent the day improving the home of How Au-Yeung and Anita Perez in Sacramento. Even the garage got a complete redo. For the past several years, the Interact Club has raised $5,000 through their community service work to pay for the expenses of upgrading a home for an owner who lacks the resources. 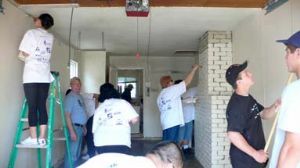 The program is operated through Rebuilding Together Sacramento, a nonprofit. The home selected this year is owned by How Au-Yeung and Anita Perez. How Au-Yeung has been blind since the age of 2, when he was abandoned in a rice field in China. Rotary member Mike Russell volunteered to take on the responsibility of House Captain, determining the scope of the project, ordering supplies and equipment and supervising the work. All hands were busy throughout the day. Everything was moved out of the house early in the morning. The old carpet was removed and new carpet laid. All the walls, trim and doors were repainted. The back door frame was rebuilt and a new door put in. New tile flooring was laid in the kitchen and bathroom. Weeds were removed from the grass and the grass was cut. Overgrown shrubs were trimmed. Volunteers even removed a large pile of green trimmings from a neighbor's yard. The owners were overwhelmed with emotion as they experienced the transformation throughout the day.